I waited 50 years to start thinking about caring for my skin. I was a stay at home Mom who raised two wonderful boys who are now 21 and 22. They are one year and a day apart. Between competitive hockey and school, I didn’t give my skin much thought. Blink and the time just flies by. Living in Colorado is so harsh on our skin. 80s one day and snow and 27 the next. And that’s in May! Crazy. How do we cope? Well-we have craft beer! Oh wait-I’m off track. I do have friends who do lots of procedures. That works for them and they look great and take care of their skin. Me, I’ve been au naturalle. Since my 50th birthday is in July, I started wondering if I should be doing something more to protect and care for my skin. Over the next few months, I will be embarking on a journey of skin treatments with a local holistic skin therapist. Melissa Stewart, the owner of Soak Skincare Spa will help educate me on taking better care of my skin. 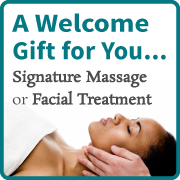 She’ll start with her Signature Facial using only botanically based products from Auspect Skincare International. One of the main reasons why I agreed to write about these treatments is because it is important to me to care for my skin with products and treatments that were non-invasive or harmful. I was instructed to remove all my clothes and to slip under sheets that were warmed and oh so cozy. The facial began with a lavender aromatherapy inhalation, then my feet were washed with warm cloths, massaged with lotion and cocooned in warmed foot booties. Steam was applied while my face was cleansed followed by a thorough skin analysis, a fruit enzyme exfoliation and extractions of those pesky blackheads. A heavenly neck, shoulder and facial massage took me to a blissful state. While my skin and lips soaked up a much needed hydrating masque and lip balm, my arms and hands were also massaged. Hot towels were used to remove my masque, rose-scented toner was applied along with customized serums, moisturizer and sun protection. But it did not end there…the foot booties were removed to be followed by my feet being wrapped in hot towels. This facial experience concluded with an rejuvenating lemongrass aromatherapy inhalation and a scalp massage. Ahhhhh…..